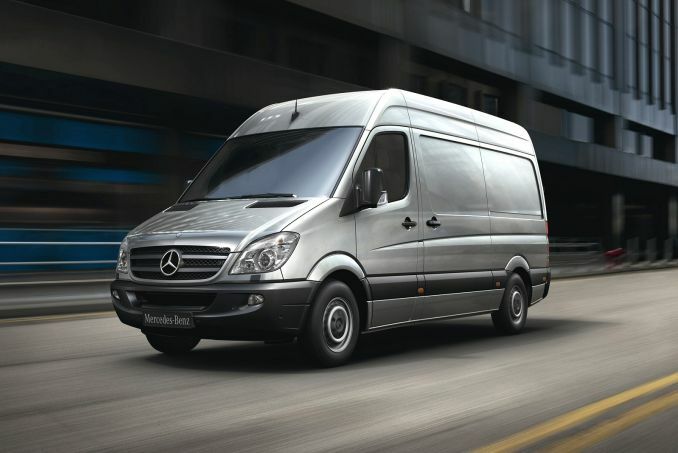 The Mercedes-Benz Sprinter has long been the byword for excellence and performance in the full-sized van sector. The latest range builds on efficiency and safety in significant ways, adds some style inside and out but remains focused on sheer practicality. With over 2 million vans produced, the Mercedes Sprinter has come to define the large van sector. It's by far the best-selling LCV across Europe, tracing its lineage back to 1995, with a second generation model appearing in 2006. A range of Eruro5-compatible CDI diesel engines appeared in 2009 which stuck it to the likes of the Vauxhall Movano/Renault Master design and the Peugeot Boxer/Fiat Ducato/Citroen Relay collaboration, plus of course the VW Crafter alternative. Mercedes was, after all, first to introduce a V6 engine to this segment, first to introduce Stop-Start technology to cut costs and is a leader in promoting natural gas power as an alternative. This latest model looks to improve on safety and efficiency markedly while introducing ever cleaner Euro6-compliant powerplants, the world's first van to do so. Aside from the improved efficiency and cleanliness of the engines, not a lot has changed with regards to driving characteristics. Customers still get to choose from versions of Mercedes' doughty 2.1-litre four-cylinder common rail diesel, an engine which has forged a strong good reputation for its combination of performance, economy and refinement and, almost uniquely for a four cylinder LCV diesel, is fitted with balancer shafts to eliminate vibration. As with previous Sprinter models, this unit comes in three states of tune, the options beginning with the 95bhp entry level version. Though this version has a useful 250Nm of torque, it has only a single-stage turbocharger that can't match the smoothness or response offered by the twin-turbo that's fitted to the 129 and 163bhp versions of this engine. 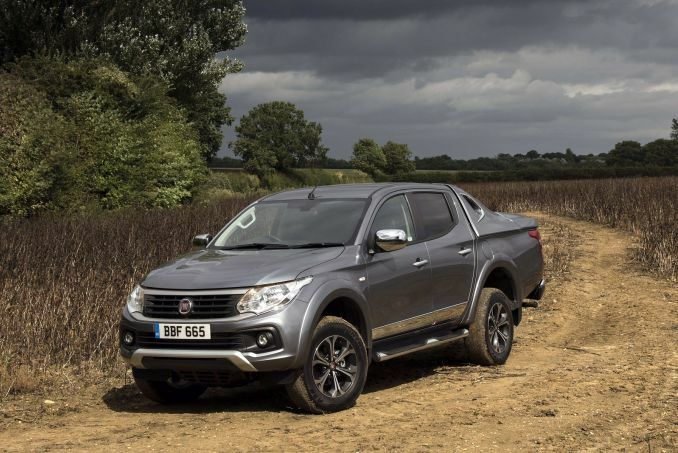 These respectively deliver either 305 or 360Nm of pulling power, enough to deal with increased towing weights that in the case of the 3.5 tonne model that most businesses buy have risen to the same figure, 3.5 tonnes. Unusually for a van in this sector, there's also a 190bhp V6 CDI diesel option offering a massive 440Nm slug of torque so potent that it must be channelled through a redesigned version of the 6-speed manual gearbox. In fact, Mercedes has redesigned all Sprinter gearboxes in recent times, adding 'ECO Gear' labeling that refers to the way that ratios have now been more widely spaced for efficient running, topped and tailed by a very low-geared 1st for snappier hill starts fully loaded and a long-striding top to massage economy and refinement on the motorway. And talking about snappier starts, if you choose the five-speed automatic gearbox option, it comes with Start-Off Assist, essentially a hill-holder clutch to stop you drifting backwards on uphill junctions. As an alternative to the diesel engines, the Mercedes-Benz Sprinter is also available with a Euro VI compliant supercharged four-cylinder natural gas engine featuring direct injection. The engine generates 156 hp (115 kW) from a total displacement of 1.8-litres. Power is transmitted either by the ECO-Gear six-speed manual transmission or the 7G-TRONIC PLUS seven-speed automatic transmission with lock-up clutch, which is the only system of its kind to be found in a van. The latest Sprinter gets a bolder three-slat radiator grille with a distinctive frame around it, giving it a clearer Mercedes identity. Another change involves the headlights, which are now more angular. The covers on the reflector housings divide the headlights into separate segments. The bonnet is higher while the bumpers have more chiselled lower edges similar to those found on SUVs. Double-segmented tail lights have also been fitted. The interior was already the best in the sector but it's been further enhanced with this model. Comfort has been boosted by improved upholstery and seat coverings, the thicker steering wheel is a nice touch while the air vents are finished in chrome if the customer opts for a multifunctional steering wheel. The knob of the gearshift lever has been redesigned as well. The Sprinter is also fitted with a radio system that equips the van not only with state-of-the-art electronic entertainment features and Bluetooth telephone equipment (including a telephone keypad and phonebook), but also the Becker MAP PILOT navigation system. 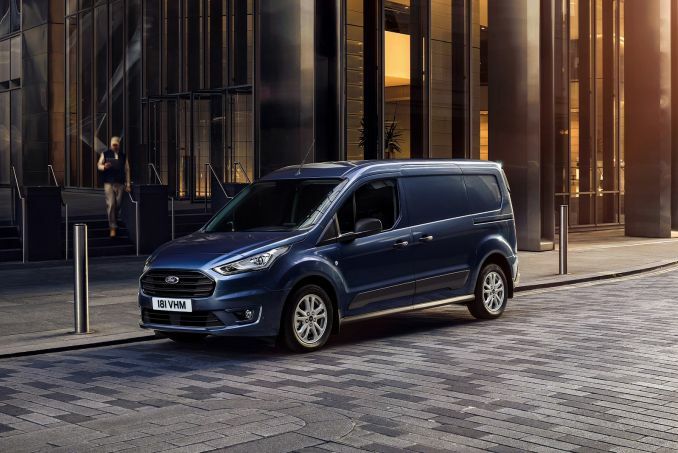 As you would expect for a van range like the Sprinter, customer choice is virtually limitless, but the van encompasses a price range of between £21,000 and £35,000, which is a little more than what you'd pay for the likes of a Ford Transit, or Vauxhall Movano, but experience has shown that the Sprinter tends to make up for this over its whole life due to better reliability and beefier residuals. Mercedes' appetite for innovation is apparent in the development of this latest version, most notably in the fitment of the sort of safety features that not so very long ago were the preserve of luxury saloons. 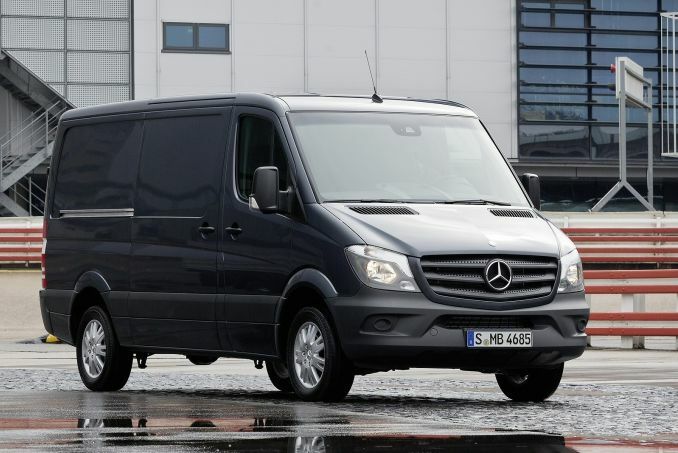 The Sprinter is available with Crosswind Assist, which is fitted as standard, and COLLISION PREVENTION ASSIST and Blind Spot Assist, which are both optional. Other key safety features are Highbeam Assist and Lane Keeping Assist. On top of the latest safety functions, you also get more commonplace features such as ESP stability control with ASR Acceleration Skid Control on all models, plus ABS with Brake Assist and electronic brakeforce distribution to maximise its effectiveness, a bulb failure indicator and a useful feature that flashes the rear lights to warn following motorists in emergency stop. As for the Sprinter model range, well first you've to decide on your bodystyle. As well as the Panel Van, there's also a Traveliner minibus option that can seat up to 17 people, plus the usual Chassis Cab and Dropside options. 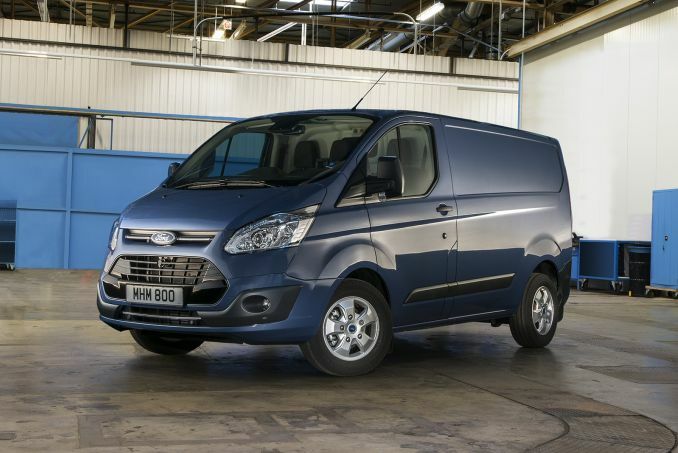 But if it's the van you want, there's a choice of Standard, High or Super-High roof heights. That you might expect but more unusual in this class is the provision of up to four body lengths - Short, Medium, Long and Extra-long. Then, depending upon the kind of use you have in mind, you'll need to decide upon a Gross Vehicle Weight - 3.0, 3.5, 4.6 or 5.0-tonne. This latest Sprinter is the world's first van to meet Euro6 emissions rules, future-proofing it better than any of its rivals. The combination of highly efficient diesel engines, the optimised powertrain, a longer axle ratio, improved ancillary components and the BlueEFFICIENCY PLUS efficiency package has reduced fuel consumption to a minimum of 44.4 mpg (NEDC combined), which is a record value for the Sprinter segment. However, the Sprinter is extremely economical not only as a result of its high fuel efficiency, but also because it comes with the ASSYST maintenance calculation system as standard in Europe. Thanks to this system, the van's maintenance intervals, which were already long, have been extended to up to 37,000 miles, helping cut operator maintenance budgets significantly. The Sprinter founded its reputation on solid practicality and the latest model is no exception. The rear doors can be swung through 270-degrees and latched against the sides and the rear door aperture is 1565mm in width, while its height is either 1540 or 1840mm, depending upon your choice of roof height.  Ultimate loading capacity does of course depend upon your choice between four body lengths. There's the Short one that has a loadspace length of 2600mm, the Medium version that boosts this to 3265mm and the long or extra long options with their extended overhangs that boost total loadspace length to either 4300mm or an enormous 4700mm. The compact and long options sit on a standard wheelbase of 3,250mm or 3665mm but the lengthiest 'long' or 'extra long' models get an extension between the wheels to 4,325mm. Near vertical interior walls and levelled-off wheelarches mean that you can make the very most of the space on offer. The Mercedes-Benz Sprinter van has become the byword for excellence in the LCV sector but that excellence tends to come at a price. 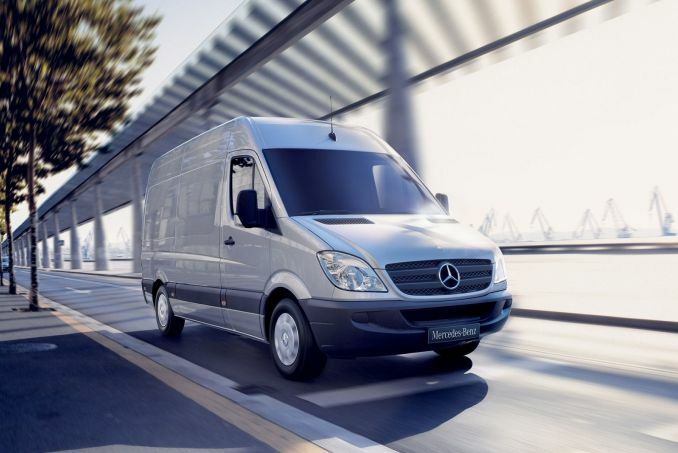 Sales have remained strong across Europe as operators realise that making false economies in this sector is a mistake they're not keen on making and the Sprinter's market positioning will doubtless be improved by this latest model. To be honest, not a lot needed doing to retain its position, but Mercedes remains an engineering-led company and it's a welcome boost to see engine efficiency improve. The addition of some welcome additional standard safety features will doubtless boost appeal to owner operators while the interior has also been incrementally improved with more comfortable seating. If you wanted the best van on the market, the choice was always rather easy. Some things just don't change.